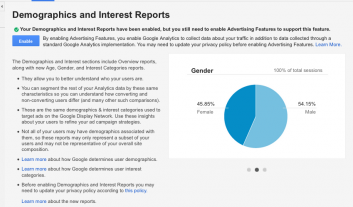 Demographics and interests reports in Google Analytics give you additional insight about your users, allowing you to do analysis based on age, gender and interest categories. You get a much better idea of who your users are and the setup is so quick to do, there’s no reason not to. To get this information, you need to do minor tweaks to your Google Analytics and Google Tag Manager. Those changes will allow Google to share anonymised data about your site or app visitors, and once set up, you can use this information to understand the behaviour patterns of your users by different profiles. What reports will you get? How does Google get this data? Google collects demographics and interests data from the third-party DoubleClick cookie for web traffic and anonymous identifiers for mobile app activity, like the Android Advertising ID and the iOS Identifier for Advertisers. But Google is unable to collect this data if the cookie or anonymous identifier isn’t present, or if there’s no profile information available. As a result, this data may only be available for a subset of your users. This will be shown on the report as a % of traffic the report represents. There are occasions when data is withheld from your reports to ensure the anonymity of users. For example, this might happen when you don’t have enough data for a particular age range or gender. When the threshold has been applied, you will see a notification below the report title. Go to Admin > Property > Property Settings. 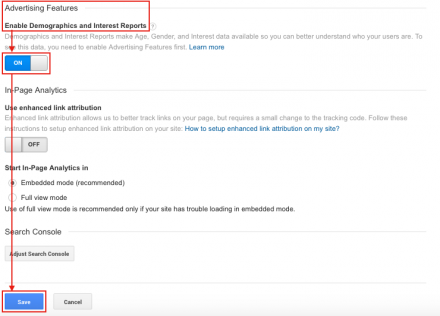 Scroll down to Advertising Features, and set the option to Enable Demographics and Interests Reports to ON. 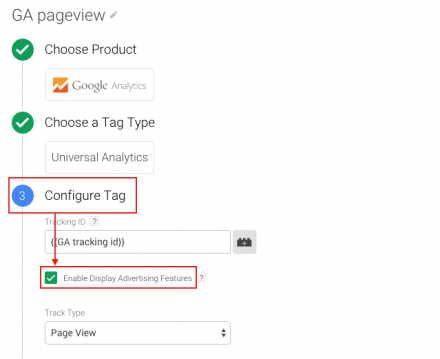 Go to edit your GA pageview tag > Configure Tag. Under the tracking ID, tick the Enable Display Advertising Features box. Save the tag, and you’ve got one last step to do. For this go to Audience > Demographics > Overview report. Click Enable, and you’re all set. You should see your demographics and interests data within 24 hours of enabling the feature. We also provide consultancy services if you need help with more advanced setup.